For quantified Boolean formulas (QBFs), preprocessing is essential to solve many real-world formulas. The application of a preprocessor, however, prevented the extraction of proofs for the original formula. Such proofs are required to independently validate correctness of the preprocessor’s rewritings and the solver’s result. Especially for universal expansion proof checking was not possible so far. In this paper, we introduce a unified proof system based on three simple and elegant quantified resolution asymmetric tautology (QRAT) rules. 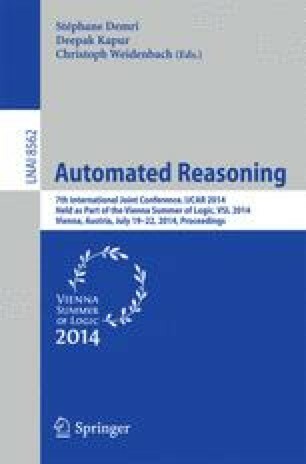 In combination with an extended version of universal reduction, they are sufficient to efficiently express all preprocessing techniques used in state-of-the-art preprocessors including universal expansion. Moreover, these rules give rise to new preprocessing techniques. We equip our preprocessor bloqqer with QRAT proof logging and provide a proof checker for QRAT proofs. This work was supported by the Austrian Science Fund (FWF) through the national research network RiSE (S11408-N23), Vienna Science and Technology Fund (WWTF) under grant ICT10-018, DARPA contract number N66001-10-2-4087, and the National Science Foundation under grant number CCF-1153558.